While not necessarily considered one of Samuel Fuller’s best films (or even one of his better ones) by a number of people I know, Merrill’s Marauders is still a fascinating film in the director’s oeuvre. While not as stylishly lurid as The Naked Kiss (1965) or as pessimistically sarcastic as Pickup on South Street (1953), it remains a fairly straightforward exploration of a theme that runs throughout Fuller’s work: the relationship between the individual and the group. I said “fairly” straightforward. 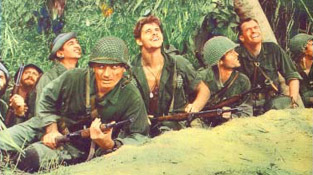 Compared to other Fuller films, Merrill’s Marauders is straightforward. Now, Fuller wasn’t one to use complex plotting strategies or deep character development, but he had a fondness for tangents. In Shock Corridor (1963), for example, the most energized scenes are the ones dealing with the various forms of insanity suffered by the asylum inmates. Ask most fans of the film which scene they remember most, and they usually point out the one with the African-American character (a former integrationist who’d been harassed one too many times) who provokes a near lynching by spewing out a litany of racist propaganda. Now, while entertainingly jarring (or jarringly entertaining, depending on your sense of humour), the scene has no real value in the exposition of the core story. It’s an aside, yet it’s these asides that Fuller threw a lot of his focus on. After watching enough of his films, you realize that the stories exist to support these flamboyant asides, and this is what makes any simple reading of his films difficult. These asides create a subtext that often contradicts the story itself. In Merrill’s Marauders, however, this formula is reversed. The asides (along with the shots, the montages, and almost every other aspect of the film) are subservient to the telling of the story. In one scene, the soldiers are making a trek to their next point of conflict. As they’re going up a trail on a cliff, one of the soldiers loses his footing and plummets to his death. The other soldiers pause briefly, and keep going. They’re too burned out to try to save him, and they hope they’ll go home after this next mission. Yes, the soldier’s fall is filmed in a way to provoke a reaction, but instead of calling attention to itself, it helps us understand what’s going on in the other soldiers’ heads, and helps the story move along. So what is the story? A bunch of soldiers, at wit’s end, fight until they can’t anymore. Wow. There are more than enough films by Howard Hawks and John Ford that cover the same ground. But unlike those two masters, who mythologized the “man who was a man until the very end,” Fuller (a veteran of WW II) instead allows his characters to degenerate into twisted reflections of what we expect ‘men’ to be by focusing in on what happens to them under duress. The soldiers follow orders, grudgingly, but instead of just doing their jobs and keeping their mouths shut, they openly complain about the conditions they have to deal with. “When are we going home?” becomes a common refrain. You’d never hear those words coming out of John Wayne’s mouth, but at the same time, you can’t look at these soldiers as a bunch of “whiny sissies” (to misquote a John Wayne euphemism). The audience is constantly made aware of what the soldiers are going through, and the sentiment is understandable because of it. So what keeps these guys going? Well, there are two ways of saying it. First, each other. Second, they’ve sublimated themselves to the group. Either way would be correct, believe it or not, but this is where Fuller’s love of duality and irony come into play. He might be ‘straightforward’ in telling the story, but he allows enough on screen to force the audience to wonder what the implications are. (Much like the film itself.) Hidden inside this ‘straightforward’ story lies questions that don’t have an easy answer. Why does General Merrill push the soldiers onward? Does he think that desperation makes better fighters? Is he trying to gain a place in history, or is he angry that he’s not as healthy as he once was? Does he hide his heart condition from everybody because he wants to keep the appearance of superiority or is he just plain suicidal? When he collapses, and lieutenant Stockton pushes the regiment to keep fighting, is he trying to ‘honor’ his commanding officer’s memory, or is he going for a game of one-upmanship? And why do the soldiers even go along after realizing how bad off they are? But rather than make these questions blatant, Fuller just keeps the story going along, leaving everything else for the audience to think about. We never find out, for example, exactly why one of the soldiers starts crying when a group a villagers who descend upon the sleeping soldiers starts to feed him. There’s no comment on this. We know what the soldiers are going through physically, but the emotions they’re dealing with are left to the audience to infer. Along with all of this, Fuller is a master of editing and framing a scene. He has a knack for placing actors and items within a frame in a way that exploits every possible interpretation but doesn’t endorse any of them. This talent is evident in almost all of his films. He shows just enough for the audience to get the gist of the story and pulls back from giving anything more (think of the pick-pocketing scene that opens Pickup On South Street). Merrill’s Marauders is full of scenes like that. There’s one where a soldier gets killed by the Japanese as he’s trying to sneak to a food drop-off. Or another where the owner of a donkey dies from exhaustion after carrying the munitions his broken animal couldn’t in order to save it. But these garish images lead directly into the next image, commenting on what’s happened before and what’s to come later (for example, halfway through the film, after a brutal battle, the lieutenant is walking across what looks like a bunch of gigantic coffins). Some people keep a certain distance when dealing with Fuller. They are uncomfortable with his ‘politics,’ or his lack of any concrete sensibility. While Fuller’s films seem (on the surface) to endorse “society” (for lack of a better term), he was also aware of the flaws in following the group mentality. He understood the importance of knowing yourself (think of the undercover reporter who succumbs to insanity in Shock Corridor), yet he also knew that there were times when you had to give yourself over to something more. Ultimately, that’s the question he grappled with in all of his films. And, to his benefit, he was never able to answer it. KinMarcus Ferate is a writer, low-budget filmmaker, waiter, father, and all-around film geek living in Seattle, Washington. He is currently in love with Bresson, Fuller, Celine, The Kids In The Hall, Bill Hicks, Slowdive, Public Enemy, Pasolini, Anger, Fassbinder, and, the two most perfect children in the world (his, of course).